The President of Bosnia’s Republika Srpska recently signaled his support for Vucic’s plan to partition Kosovo, but while he may try to clothe his arguments in pragmatism, Dodik is really only concerned with promoting his own interests. The name Milodrad Dodik is one that usually inspires a sense of pride in many Serbs, seeing as how he’s generally regarded as their most patriotic representative anywhere in the region, but it could soon lead to an empty feeling of disappointment if people take the time to reflect on the self-interested reasons behind his support for Vucic’s Kosovo partition plan. The President of Bosnia’s Republika Srpska originally entered into office as a somewhat Western-friendly politician but soon adroitly shed this image in response to changing political circumstances, eventually emerging as an anti-imperial champion in the Balkans. His rhetoric and actions were all the more attractive to Serbs because he never shied away from calling things out for what they were and therefore seemed to be unrestrained by the chains of “political correctness” that exposed their own leaders as American quislings. His reputation is hard-earned and deserves to be respected, but sadly Dodik is at risk of losing the goodwill that he engendered among all patriotic Serbs after some of his latest comments on Kosovo. On the surface, this seems to be linked to his other statement to have Republika Srpska seek the same UN status as Kosovo if the latter ever obtains universal recognition, which is being portrayed by some as a pragmatic position to take to what might be Belgrade’s inevitable surrender of its historic territory. There might be more to it than just that, however, and dwelling upon it might change how people view Dodik. In connection with this, the reader should be made aware of one of Dodik’s other recent statements on the matter, which hypocritically embodies the emotional viewpoint that he previously denounced. He fear mongered about a reunified Serbia by telling Serbs that “In order to obtain international recognition of your government , you would have to give Albanians 30 percent of the seats in Parliament, the position of the prime minister, parliament speaker or president. You would have to introduce their language in the parliament. If anyone thinks we can do that, let’s push for it.” His disturbing insinuation is that Serbs and Albanians cannot peacefully coexist with one another, thus suggesting an endless cycle of partitions within Serbia proper to cede territory from the state’s eponymous majority ethnicity to any growing population of minority groups within its borders and specifically residing near an international frontier. Some Kosovo Serbs responded to Dodik’s doomy scenario by rhetorically asking why a much smaller percentage of Serbs in Bosnia can thrive but those in a reunited Serbia apparently wouldn’t be able to. It’s clear that Dodik is a political opportunistic and will stop at nothing to support the people who he’s been entrusted to rule over, which is commendable but needs to be contextualized because this is only the population of Republika Srpska and not all Serbs like some may have thought. Were it the latter, then he could never reconcile himself with signaling any level of support for Vucic’s partition plan, especially because of the high risk that it entails for catalyzing a chain reaction of border changes in the Balkans, especially in Bosnia and the Republic of Macedonia. 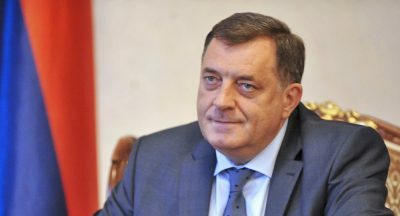 The first-mentioned might temporarily be advantageous for Dodik – or at least the optics of him flirting with it could be – but dangerously backfire if Croatia leads the so-called “international (NATO-backed) community” in “restoring Bosnia’s territorial integrity”, while the latter would pave the way for the formalization of “Greater Albania”. Both of these outcomes are detrimental to Serbian interests and can’t be challenged without sparking another regional war, which is why Dodik’s support of the Kosovo partition plot is far from “pragmatic”. Even in the so-called “best-case” scenario where these disastrous eventualities don’t come to pass (or at least not immediately), there’s a chance that Serbia proper might eventually fragment into “decentralized” regions as a result of the centrifugal processes that would once again be unleashed in the Balkans, which could thus encourage the long-term (key word) development of a “clannish” mentality among the Serbs that wouldn’t be out of place in Albania. This might be personally desirable for Dodik, however, because he could project himself as the most powerful “(war? )lord” of the most stable Serbian “fiefdom” in his people’s remaining transnational cultural space. Relatedly, this formerly Western-friendly politician might have even been swayed by assurances from his “old (former?) friends” that the US wouldn’t object to the eventual integration of this Serbian-populated areas of the Balkans as part of Timothy Less’ “master plan” for the region. It’s highly unlikely that the US would ever keep its word in this regard if it did indeed use this as a carrot for convincing Dodik to back Vucic’s partition plans, but that might have been lost on this leader who looks to be following in the 1990s footsteps of Belarus’ Lukashenko. This post-Soviet politician believed that he could rule a forthcoming “union state” with Russia if the two parties successfully merged because of how utterly inept Yeltsin was. It’s not a coincidence, then, that Lukashenko effectively halted all progress in this direction since Putin’s entrance into office because he realized that his dreams were now unattainable. Dodik, however, thinks that his own might still be within reach, though unlike Lukashenko, he’s being tempted with the chance (but crucially, no guarantee) of this happening so long as he lends his support to Vucic’s partition plan. Should this be the case, then that would be an epic error of judgement if there ever was one because Dodik is sacrificing his respectable reputation in pursuit of an unachievable and self-interested dream.